Author and blogger Michael Hyatt recently released a podcast on How to Discern Your Calling. Hyatt lays out three essential ingredients that turn a person’s vocation into their calling. You must love what you do, you must be talented at what you do, and you must be able to make a living doing it. His definition is spot on, but predicting the place where your passion, proficiency, and profitability intersect is no easy task. In fact, keeping your eyes firmly on a single target may lead you astray. Rather than focusing on one possible calling you hope to eventually fulfill, consider the concrete steps you can take now. Set manageable goals, develop new skills, and keep an open mind. You may discover an alternate route to realizing your dreams, or even a calling you didn’t know existed. You won’t know until you start doing. Hyatt’s second element in discerning your calling is proficiency. In other words, finding your calling requires you to build skills. A good way to accomplish this is by setting goals that center around skill development. This doesn’t only apply to long term goals—accomplish something every single day. Then, reflect. What did you learn? How do your accomplishments build toward something larger? The more proficient you become at a variety of skills, the more likely you are to be able to apply them to something you are passionate about or use them to turn a profit. Through all your hard work, you may discover a new passion, and that may become your calling. Take opportunities that challenge you to learn new skills or hone old ones, both at work and at home. If your current job gives you everything you need to realize your calling, congratulations. Work hard and do what you have to do. For everyone else, don’t stop creating and seeking out new opportunities. Don’t shun anything purely on the grounds that it doesn’t align with your interests. Just because a job isn’t your calling doesn’t mean it won’t help you reach your calling. Again, this takes a lot of reflection. Seizing new opportunities shouldn’t mean taking a job that makes you miserable, but if it has the potential for long term benefits, don’t let it pass you by. Take on responsibilities at work, especially when they further your goals, and focus on your passion at home. If you want your passion to become a calling, treat it with the seriousness of a second job. Align your work and home efforts whenever possible. A calling is often framed as an endgame, but focusing on a destination can also put you in a box. A calling should come about through a cultivation of skills and experiences. There is trial and error involved, but confining yourself to a single track cuts you off from so much potential greatness. If you are careful and work hard, it is possible to find the intersection of passion, proficiency, and profitability. P.S. WorkBoard is an excellent tool for creating and managing your goals, as well as your team's goals. Track your progress over time and see how your deliverables build toward larger accomplishments. Michael Hyatt spent more than two decades in top positions in the publishing industry, including as the CEO of Thomas Nelson Publishers. Today he writes inspiring posts on “intentional leadership” on his personal blog and hosts the popular podcast This is Your Life. Hyatt has written seven books, most recently Platform: Get Noticed in a Noisy World. 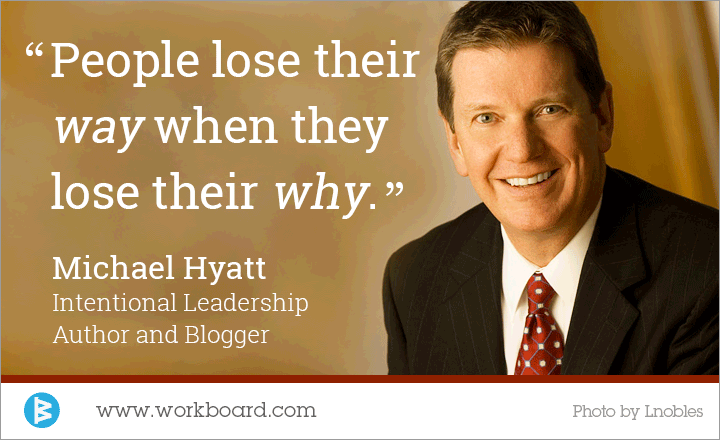 To learn more, check out www.michaelhyatt.com.